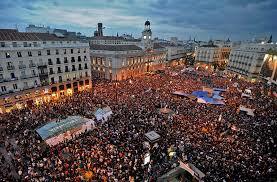 After a demonstration, on May 15 2011, around forty people decided to sleep in Puerta del Sol, one of Madrid´s central squares. This was the origin of a complex protest camp, that would take a phenomenon which had its origins in the Arab Spring to the Western World. On that first night, Kamen Nedev was already there. This Bulgarian sound artist and cultural manager came to Spain in the late eighties, and was later involved in diverse projects linked to creative activism. At Puerta del Sol he seemed to be wearing earphones. In reality, he was carrying a binaural recording system, with which he recorded the first assembly, that took place at dawn. He never stopped. Ever since May 15 2011 he has captured the sounds of all the demonstrations he has been to -and Nedev seems to be everywhere. In his sound archive one can hear conversations and slogans. Voices that demand a change, whispering or shouting about another possible world.